LucidChart is an HTML5-based visual collaboration tool that makes drawing diagrams fast and easy. Work together with an unlimited number of others to create and edit diagrams in real time, with changes merged and synced instantaneously - great for team collaboration and working with clients. 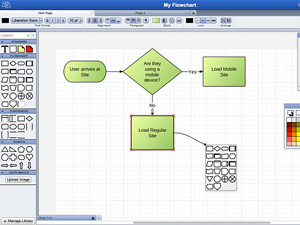 The easiest way to draw flowcharts, mockups, UML, mind maps and more.